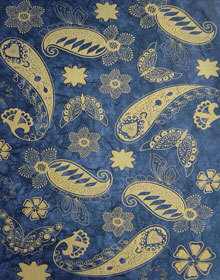 A lightweight milled paper with siver strand inclusion dyed in dark blue color that is hand screenprinted with paisley, flower and butterfly in yellow color using specialty ink. Great wrapping paper. Semi-translucent and therefore perfect for any application in which light shows through. Also good for any accenting work.